MadMenYourself.com is part of the promotion for the AMC Mad Men Premiere on 16th August - and I have had a quick play with Mad Men Yourself to see how it works. 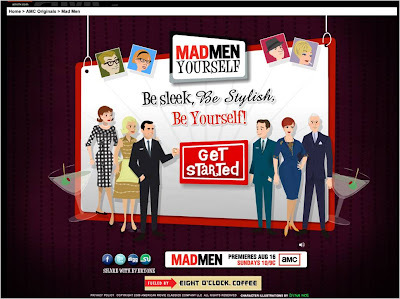 The Mad Men Yourself site lets users create a customised Mad Men character that can then be downloaded for use on social networks, desktops etc. The first stage of Mad Men Yourself is to choose whether you want to be a 'Suit' or 'Skirt'. 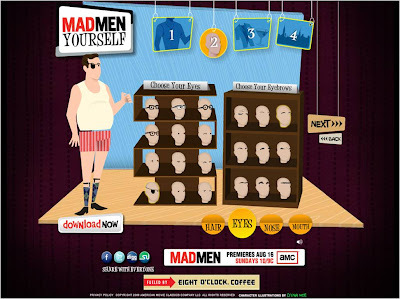 The site then goes through a series of different screens that allows for the user's Mad Men character to be customised in a variety of different ways - from facial features, through to clothing, accessories and scene selection. Mad Men Yourself is reminiscent of the Wii console's Mii feature, where Wii users can create their own 'Mii' avatars for use in Wii games. 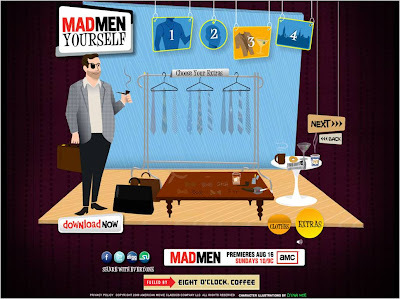 Mad Men Yourself takes a slightly different approach at the end of the design process, allowing users to download their Mad Men Yourself creation for use on social networks, iPhones and Desktops. This well thought through final stage is even setup so that users can download the optimal format for the platform that they want to use it on. 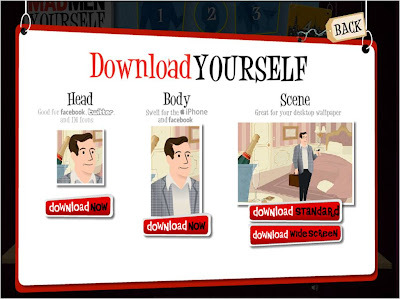 Mad Men Yourself is a quirky bit of viral promotion that combines the Wii Mii avatar creation idea with the 'Yourself' concept that has previously been popular with Elf Yourself or Obama Yourself. Interesting to see how many people go through the MadMenYourself process and what percentage use their creations elsewhere online.